It's week #5 in the SoCon, and time to pick Saturday's games. All five games are set for Saturday, four conference games, and one OOC game. The Bucs travel to Travelers Rest to meet the Paladins, in what should be a good game. The Bucs seriously challenge the home standing Paladins, but Furman pulls it out, 35-28. The winless Keydets travel to Macon to meet the disappointing Bears, winless in two SoCon starts. The pain continues for VMI as the Keydets are unable to slow down the next steamroller headed their way. Bears win 35-10. The Cats, riding a three-game winning streak, travels across the mountains to Chattanooga to face the Mocs in what is probably the game of the week in the SoCon. Once again, the Cats defy the odds makers and bring home a victory, Cats pick up win number 4 by a 38-21 margin. The Wofford Terriers travel to Clinton to play the Blue Hose of the Big South Conference. The Terriers continue to grind out the rushing yardage, eat up the clock, and pile up the victories. Terriers win 38-3. Here's this week's P&G rankings after week #4 of play, last week's rank in parentheses. For the fifth game of the season, the Cats travel to Chattanooga, TN for what will be the third road game of the young season. Chattanooga has become a very difficult place for the Catamounts to win. Both teams are coming off conference wins, as the Cats upset #17 Samford and the Mocs dominated VMI on the road. The Cats last won in Chattanooga in 2005, with a 38-20 victory. and the Cats are currently on an eight-game losing streak against the Mocs. The Series: The Cats own a 16-27-0 all-time record against the Mocs, having first played in 1973. Currently, the Mocs are on an 8 game win streak in the series, with the Cats last victory against the Mocs coming in Cullowhee in 2008. - JSU (away) - The 12th-ranked Chattanooga Mocs dropped a 27-13 decision at the hands of No. 5 Jacksonville State in the Cramton Bowl. - LSU (away) - The 13th-ranked Chattanooga Mocs dropped a 45-10 decision at No. 12 LSU. UTC falls to 0-2, while their hosts improve to 2-0. - UT Martin (home) - The 15th-ranked Chattanooga Mocs could not overcome an early deficit in a 21-7 loss to UT Martin in the home opener at Finley Stadium. It drops UTC to 0-3, while UTM improves to 2-1. - VMI (away) - UTC opened Southern Conference play with a 63-7 triumph over the Keydets in Foster Stadium. The last time we played Chattanooga: Oct. 29, 2016 - Newsome Breaks School-Record in 38-25 Loss to #8 Chattanooga - Western Carolina junior tailback Detrez Newsome rushed for a school-record 277 yards and two lengthy touchdowns, but it was not enough to derail the eighth-ranked Chattanooga Mocs. UTC’s Ricarde Bagley scored three touchdowns including two on the ground as the Mocs downed the upset-minded Catamounts, 38-25, on Homecoming at E.J. Whitmire Stadium / Bob Waters Field. The Mocs entered the season with high expectations, but dropped their first three games, picking up their first win against the SoCon's other winless team, VMI. A large piece of the Mocs problems revolved around the absence of senior quarterback Alejandro Bennifield. Bennifield was suspended for 4 games by the NCAA and is eligible to return for the Western Carolina game. Sophomore quarterback Nick Tiano has picked up four starts in the absence of Bennefield, at this time it's unknown which of the two will start the Western game, but I expect to see Bennifield with significant playing time with or without the start. Chattanooga placed a league-high 10 student-athletes on the SoCon preseason all-conference teams. Senior defensive back Lucas Webb was joined by junior defensive lineman Isaiah Mack, senior linebacker Dale Warren and senior offensive lineman Josh Cardiello on offense first team. Senior quarterback Alejandro Bennifield, senior running back Richardre Bagley, sophomore offensive lineman Malcolm White and senior wide receiver James Stovall were named to the second team offense. Senior defensive lineman Taylor Reynolds and senior defensive back Trevor Wright earned second-team defense honors. The Mocs were picked to finish fourth by the coaches and media. JOHNSON CITY, Tenn. – Down 20-10 early in the fourth quarter, the ETSU football team scored 10 unanswered points to force overtime with Southern Conference foe Mercer Saturday afternoon in front of a sold out crowd at their new on-campus home. In the extra period – after the Bears connected on a 29-yard field goal to take a 23-20 lead – ETSU junior quarterback Austin Herink (Cleveland) wasted little time, finding junior tailback Jajuan Stinson (Knoxville) wide open in the end zone on the Buccaneers first play of the extra period, giving ETSU a dramatic 26-23 win and its first SoCon victory of the season. HAMILTON, N.Y. - P.J. Blazejowski passed for 251 yards and three touchdowns and Furman converted three turnovers into first half touchdowns to roll past Colgate, 45-14, in football action Saturday afternoon at Andy Kerr Stadium. The win was the first for Furman (1-3) under new head coach Clay Hendrix, who returned to his alma mater last December following 10 years as an assistant coach at the Air Force Academy. "It feels great to get that first victory," said Hendrix, who spent 19 years as a Paladin assistant (1988-06). "I could not be prouder of our kids. They came in and played really well. Defensively I don't know if we could have played much better against a productive, hard to defend offense. They just set the tone for the entire game, and offensively we did a good job of capitalizing on it in the first half." 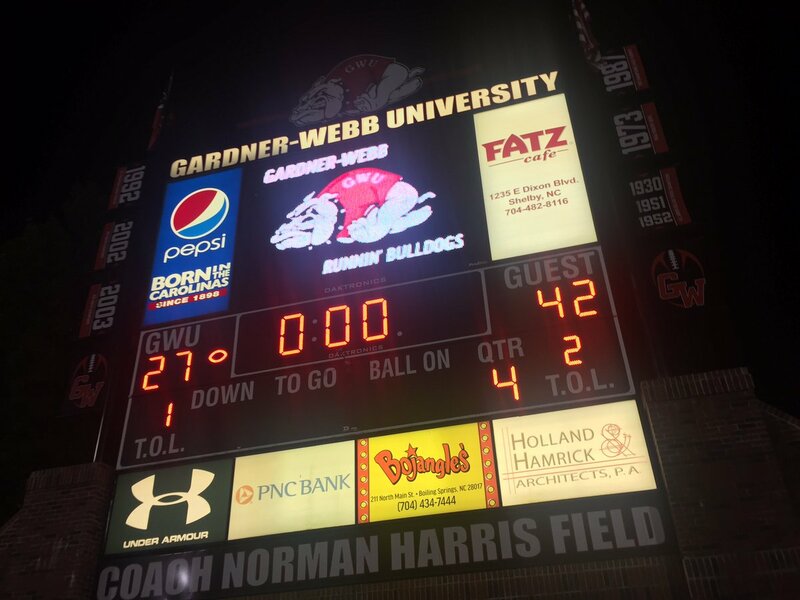 SPARTANRBURG, S.C. – On Saturday afternoon, the Wofford College football team was able to overcome mistakes to take a 27-24 win over Gardner-Webb at Gibbs Stadium. The Terriers had two turnovers and had four penalties, including two that negated touchdowns. Wofford opens the season 3-0 overall, while the Runnin' Bulldogs are 0-4 on the season. The Terriers were led by Andre Stoddard with 91 yards on 16 carries and a pair of touchdowns. Brandon Goodson was 8-of-12 passing for 117 yards and a touchdown. LEXINGTON, Va.---The Chattanooga Mocs were dominant on an unseasonably warm afternoon at VMI. UTC opened Southern Conference play with a 63-7 triumph over the Keydets in Foster Stadium. The 63 points are the second-most ever in a league game. 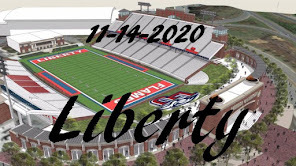 Nine touchdowns were spread over six players with Alphonso Stewart, Darrell Bridges (2), Richardre Bagley (2), Lucas Webb, James Stovall and Bingo Morton (2) all sharing in the wealth. We're back with Purple & Gold's Catamount Players of the Game. This week's selection is for the Samford Bulldogs game played in Cullowhee. Redshirt sophomore quarterback Tyrie Adams accounted for 464 yards of total offense including a career-high 152 rushing yards that featured a 23-yard score. He also threw for 312 yards and a touchdown on 19 total completions. 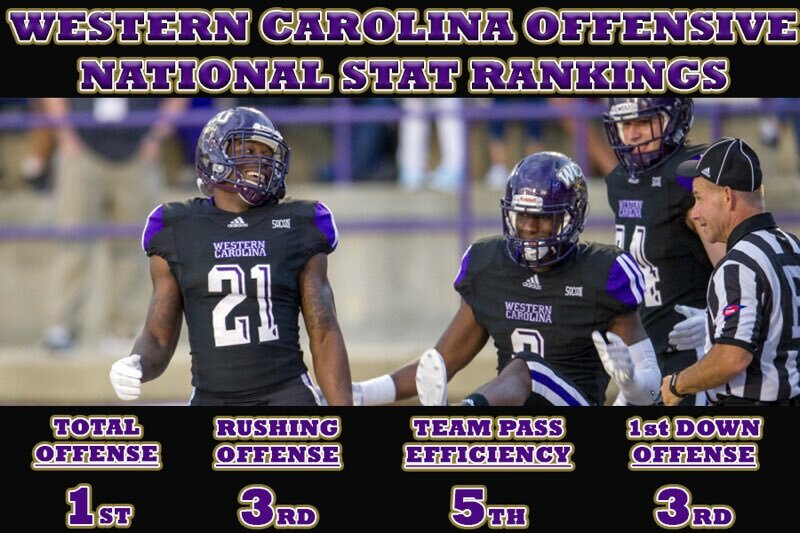 On the defensive side of the ball, junior defensive back Marvin Tillman led the WCU defensive unit in tackles, with a total of 14, 10 of which were solo tackles. Purple & Gold congratulates Tyre Adams & Marvin Tillman on their accomplishments in the Samford victory. It's week #4 in the SoCon, and time to pick Saturday's games. All five games are set for Saturday, and we have some interesting out-of-conference match-ups, as well as, three conference games. The winless Mocs travel to Lexington to meet the winless Keydets in the likely battle for last place in the conference. While both teams have had their problems this season, the train wreck that is the VMU defense just does not get the job done this week as well. Mocs win 28-17. The Bears travel to Johnson City to open their conference schedule with the Bucs who will surprise some with their game day challenge. However after all is done, the Bears pick up the win by a 28-17 score. The Samford Bulldogs travel to Cullowhee to meet the Catamounts in the battle of the SoCon's two most explosive offenses. The game outcome depends on which team's defense can make the best adjustments at the half, after a couple of wild quarters. We think the Cats defense is up to the task, and hold on to give the Cats a 42-35 win. Here's this week's P&G rankings, last week's rank in parentheses. In game four, the Cats return to Cullowhee and the friendly confines of Whitmire Stadium. This family weekend, but the Cats are now riding a two-game win streak with wins over Davidson and Gardner-Webb. Adding to the excitement and crowd size is the fact the Cats face the #17 Samford Bulldogs in SoCon opener for Western Carolina. The last time the Cats had a victory over the Dogs was in 2015, and you guessed it, the game was in Cullowhee. For the second straight week, the Cats face a quarterback that was selected preseason Offensive Player of the Year. At GWU, it was the Big South POY Tyrell Maxwell, and for Samford, it will be SoCon's POY Devlin Hodges. I think both are being outshined by WCU's own Tyrie Adams. Certainly, head-to-head against Maxwell, Adams got the job done. The Series: The Cats are 2-12 overall against the Bulldogs since winning the first outing back in 1969. Samford owned an eleven game winning streak against Western until 2015 when the Cats broke that streak in Cullowhee with a 56-36 win over the Dogs. 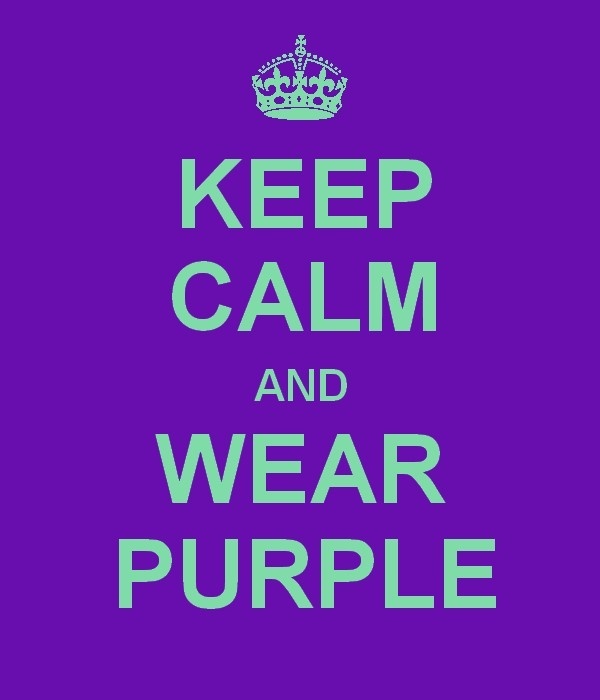 The Cats are 1-5 against the Dogs in Cullowhee, and 1-7 in games played in Birmingham. - West Alabama (Div II) (home) - The Samford football team built a 35-7 halftime lead and held on late to defeat the West Alabama Tigers, 49-41 Thursday night at Seibert Stadium. - Georgia @ Athens, GA - The Samford football team dropped a 42-14 decision at 13th-ranked Georgia Saturday night at Sanford Stadium. The Samford football team has been highly ranked in 2017 preseason polls by several publications and websites. SouthernPigskin.com has Samford ranked the highest of any preseason poll, placing the Bulldogs 9th in the nation. Athlon Sports places Samford 18th, while the Dogs are ranked 20th in Street and Smith's preseason poll. Samford returns five starters on offense and seven starters on defense from the 2016 squad. Last year's team posted a record of 7-5 overall and 5-3 in Southern Conference games, marking Samford's sixth-straight winning season. Among the returning starters are first-team All-SoCon honorees quarterback Devlin Hodges (Off. POY), linebacker Shaheed Salmon, cornerback Omari Williams and defensive lineman Ahmad Gooden. In preseason honors, Samford junior quarterback Devlin Hodges was named the Southern Conference's Preseason Offensive Player of the Year. Hodges was joined on the first team by wide receiver Kelvin McKnight, defensive lineman Ahmad Gooden, linebacker Shaheed Salmon and defensive back Omari Williams. Punter Austin Barnard was named to the second team. As a team, Samford was picked to finish in third place in the SoCon in both the coaches and media polls. However, the Bulldogs don't seem to be able to stop the big play down the field this season. West Alabama's Harry Satterwhite threw for 401 yards against the Samford defense and the Jaguars finished with 464 yards in the air. This season with three games under their belt. the Bulldogs are currently 3d in the SoCon in scoring offense, averaging 30.3 ppg, and 5th in total offense with 333 ypg. On the defensive side, the Dogs are in 7th place in scoring defense, giving up35.3 ppg and rank ninth in total defense, giving up 508.7 yards per game. Samford is in 8th place in rushing offense, and second in passing offense (behind WCU). ATHENS, Ga. – The Samford football team dropped a 42-14 decision at 13th-ranked Georgia Saturday night at Sanford Stadium. The game was played in front of a crowd of 92,746 fans, the largest crowd any Samford team has ever played before. Samford falls to 2-1 with the loss, while Georgia improves to 3-0. AUBURN, Ala. – Mercer forced five turnovers including a program-record four fumbles in an impressive but fell to No. 15 (AP) Auburn, 24-10, in an impressive defensive display at Jordan-Hare Stadium on Saturday afternoon. The Bears (1-2) proved their worth in front of an Auburn Homecoming crowd of 87,033 as they trailed by only seven points with less than five minutes remaining in the game before Auburn sealed its victory with a late touchdown. RALEIGH, N.C. -- Ryan Finley passed for 231 yards and a touchdown and Jaylen Samuels rushed for a trio of touchdowns to power N.C. State past Furman, 49-16, in football action Saturday afternoon at Carter Finley Stadium. After Furman (0-3) pulled to within 21-13 following a 71-yard touchdown strike from quarterback P.J. Blazejowski to Andy Schumpert with two minutes remaining in the first half, N.C. State (2-1) answered with an 11-play, 76-yard drive for a 1-yard Samuels scoring plunge to send the Wolfpack into halftime up, 28-13. N.C. State took advantage of a partially blocked punt, an interception, and a fumble recovery in the third quarter to score three touchdowns and put the game away. JOHNSON CITY, Tenn. – The Citadel Bulldogs scored 21 unanswered points on their first three drives of the second half to rally past ETSU for a 31-25 win in their Southern Conference opener on Saturday at William B. Greene Stadium. The Citadel (3-0, 1-0 SoCon) trailed 17-7 after ETSU (1-2, 0-1) added a field goal to its halftime lead to open the second half. The Bulldogs would score touchdowns on their ensuing three possessions to take a 28-17 lead. The Buccaneers cut the lead to three with a touchdown and a conversion, but a stop by The Citadel defense on 4th-and-2 with just over two minutes remaining sealed the win. MOON TOWNSHIP , Pa. – Quarterback Jimmy Walker threw three touchdown passes to spark Robert Morris to a 23-0 win over VMI Saturday afternoon at Joe Walton Stadium. Walker connected on touchdown passes of 23, 5, and 15 yards as the Colonials raised their mark to 2-1 on the season and get their second straight win over the Keydets in the brief four game series. Boiling Springs, N.C. (AP) - Detrez Newsome scored two touchdowns, rushing for 146 yards to go over 3,000 for his career, and Western Carolina defeated Gardner-Webb 42-27 Saturday night at Spangler Stadium. Newsome's scores came on runs of 84 and 7 yards, extending his school record for total touchdowns to 42 while posting his 13th 100-yard rushing game. The Catamounts (2-1), who came in as the FCS leader in total offense, averaging 630 yards per game, finished with 435 against the Runnin' Bulldogs (1-2). Western Carolina also snapped a seven-game road losing streak. CHATTANOOGA---The 15th-ranked Chattanooga Mocs could not overcome an early deficit in a 21-7 loss to UT Martin in the home opener at Finley Stadium. It drops UTC to 0-3, while UTM improves to 2-1. The Skyhawks scored 21 consecutive points before the Mocs got on the board. It began to turn when UTC took over on its own 9 yard line with 5:41 remaining in the third period. Purple & Gold's Catamount Player of the Game is now P&G's Catamount Players of the Game. In this, and future games, we will select both an offensive and defensive player of the game. Redshirt sophomore quarterback Tyrie Adams was 14-of-23 passing for a total of 224 yards and three touchdowns. Adams threw TD passes of 17 yards, 9 yards, and 39 yards. Adams also had 10 carries for 57 yards. On the defensive side of the ball, junior defensive back JerMichael White led all defensive players in the game in tackets, with a total of 12, 7 of which were solo tackles. Honorable mention: Detrez Newsome, rushed for 157 yards and 2 TDs - he has now rushed for over 3,000 yards in his career at Western. Daniel Riddle completed 10 tackles, with 4 being solo tackles, and 1 sack. Purple & Gold congratulates Tyre Adams & JerMichael White on their accomplishments in the Gardner-Webb game. It's week #3 in the SoCon, and time to pick Saturday's games. With two losses already under their belt, it's not looking very good this week for the Paladins as they travel to Raleigh, NC. The Wolfpack walks away with a 31 point win. The two-time defending SoCon champions travel to Johnson City to meet the Bucs in their new facility for the first ever conference game to be played there. On the down side, the Bucs lose that first conference game by about 28 points. The Keydets travel to Pennsylvania to play Robert Morris, looking for that first win of the season. I think they find it, to the tune of a 7 point win over the Colonials. The Bears travel to Auburn, hoping to keep it close and pick up a nice pay-day check. The check doesn't bounce, but Mercer does not keep it close, going down my 31. The Cats travel to Boiling Springs looking to pick up what has become elusive for the Cats, a road win. I think the Cats continue to roll on offense, winning by 21 points. The Skyhawks travel to #15 Chattanooga to renew the series with the Mocs, and hoping to pick up a win for the OVC. Fortunately, the Mocs rebound in a close game and pick up a 10 point win at home. The #17 Samford Bulldogs travel to Athens, GA to meet the Georgia variety of bulldogs. 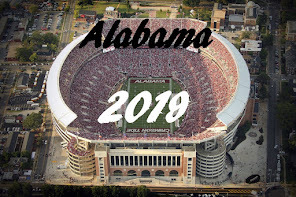 Unfortunately for the 'bama dogs, the 'ga dogs are looking to impress their fans after their big win at Notre Dame last Saturday. Georgia Dogs roll to a 31 point win. 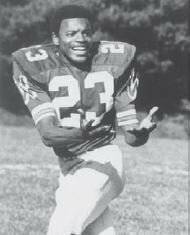 Purple & Gold joins the Western Carolina family in mourning the passing of Catamount Athletics Hall of Fame standout athlete Jerry Gaines. Family visitation at J.T. Fisher Funeral Services is scheduled for Thursday, Sept. 14 from 4:00 pm – 7:00 pm in Chesapeake, Va., with the funeral services to be held at 11:00 am on Monday, Sept. 18 at Grove Church in Portsmouth, Va. Here's this week's P&G Week #2 rankings. Last ranking in parentheses. After playing one of their most explosive offensive football games ever against the Davidson Wildcats, Western Carolina travels to Boiling Springs, NC to meet Big South Conference member Gardner-Webb for their third game of the young season. The Runnin' Bulldogs come into the game with an 0-2 record, while the Cats are now 1-1 overall. The Series: The series stretches back to 1932, and is currently tied at 4-3, with last season's win in Cullowhee. The last meeting between the two teams was 2016 saw the Cats win 44-24 in Cullowhee. Western brings in a two game winning streak against the Runnin' Bulldogs. -NC A&T (home); Gardner-Webb did not cross midfield until 12:47 remained in the fourth quarter, as North Carolina A&T held a 458-114 edge in total offense. -Wyoming (Laramie, Wyo.) Josh Allen passed for 328 yards and two scores to lead Wyoming to a 27-0 win over Gardner-Webb Saturday afternoon.